It's not unusual for cemeterians to multi-task; the manager of Sleepy Hollow Cemetery in Tarrytown researches odd stories of people buried in his grounds. The manager of Riverside Cemetery in Saddle Brook, New Jersey uses his cemetery as inspiration for his photography. Ed Bixby of Steelmantown Cemetery builds houses as his "real" job. Suzanne Kelly, chair of the Town of Rhinebeck Cemetery Committee, doubles as a book writer which makes complete sense, given her subject matter. In 2014 I found the Town of Rhinebeck Cemetery Natural Burial Ground when I was searching out green burial cemeteries for what ultimately became a guidebook. I contacted Suzanne as the person responsible for creating green burial at this otherwise conventional municipal cemetery in the Hudson River Valley, a hundred miles north of New York City. Between our first contact and publication of the guide, Suzanne published a book, Greening Death: Reclaiming Burial Practices and Restoring Our Tie to the Earth. Suzanne's inspiration for both green burial and her book came out of her dissertation. "I was thirty, working on my PhD, and preparing for some future life of the mind when my father suffered a massive and fatal heart attack at sixty-two," she writes in her introduction. Her PhD work examined the ways the female body is perceived in our culture, and as she grieved for her father this interest in the body shifted to include the dead body; what we think about it, what we do with it and why, and the implications these questions had for contemporary death care. Her academic interests focus now on the intersections of feminism, the body and the environment. "Greening death begins with waking up to the matter of death itself," says Suzanne in her introduction, and what better manifestation of this than a green burial cemetery? I visited Rhinebeck last summer on a tour of burial grounds up the Hudson River. Suzanne warned us that the town would be starting tree work, meaning lots of trucks and noise, so we scheduled the time for a lovely summer weekend when we could experience the peace of the place instead. The natural burial ground is at the back of the town cemetery, down a grassy path past a sign almost hidden in vegetation that was created by a neighbor from wood he pulled off the land. Suzanne met us at the intersection of the path with the cemetery ring road in a black pickup truck, the name of her farm, Green Owl Garlic, painted on the door. She was in the midst of a garlic harvest, dressed in a flannel shirt, shorts, and rugged shoes, and concerned about leaving her harvesters but happy to be able to talk about green burial. In 2010 Suzanne was already contemplating how to create a natural burial ground when the Town of Rhinebeck invited her to chair its cemetery board. The town had received several inquiries about green burial. Though it was not Suzanne's ideal for green burial, which more compared to Greensprings, a 130-acre cemetery in upstate New York, which is looking for conservation burial status and agreement with a land trust, Rhinebeck offered the advantages of not having to find land or funding, thus being able to jump ahead on these usually difficult hurdles and get to the heart of recreating the land itself. Like other cemeteries that use neglected woods for natural burial grounds, Rhinebeck's area is a bit raw. At 2.5 acres in a conventional cemetery of 8 acres it's too small to qualify as conservation. But the woods are borderless, extending into a much larger piece of undeveloped land that spreads down to the Hudson River. The town is following the slow process of restoration, hence the tree work, getting rid of dead trees and pruning the live trees. The cemetery has lots of land and there is a potential for future expansion. For Suzanne, the trend in the movement to eschew the word "green" in favor of "natural" is unfortunate, as she sees lots of virtue in an ancient association of the environment with the color. But the fact that green is generally linked with nature allows her to be comfortable with using both words. She also is a believer in our collective power to effect change and create a new vision for American death care. "I'm moved by the desire to frame the movement both philosophically and practically, to give voice to the deeper meanings and promise at the heart of green burial advocacy--to tie us back to an earth from which we have been separated for too long and to understand what it will take to build momentum to overcome obstacles and meet potential." 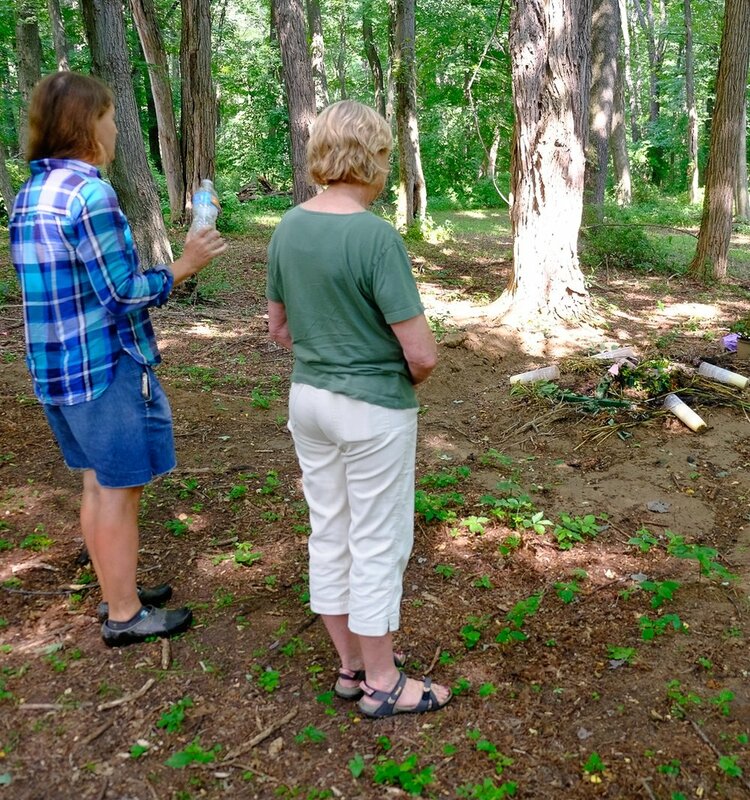 Rhinebeck's Natural Burial Ground is a woods landscape, with tall trees arching over graves that have already been filled and those purchased pre-need. Standing on the edge of a gentle downhill slope it's easy to see it blending seamlessly into the larger parcel, giving a feeling of woods going on forever. No pesticides are used in maintaining the burial ground, and plantings on graves are not allowed. Burial in a shroud is welcome and a flat fieldstone may be used to mark the grave. Rhinebeck is certified by the Green Burial Council as a natural burial ground, which means it meets all the requirements of green along with those of natural, including creating a new landscape for burial. Newer PostCan plastics ever be suitable for green burial?